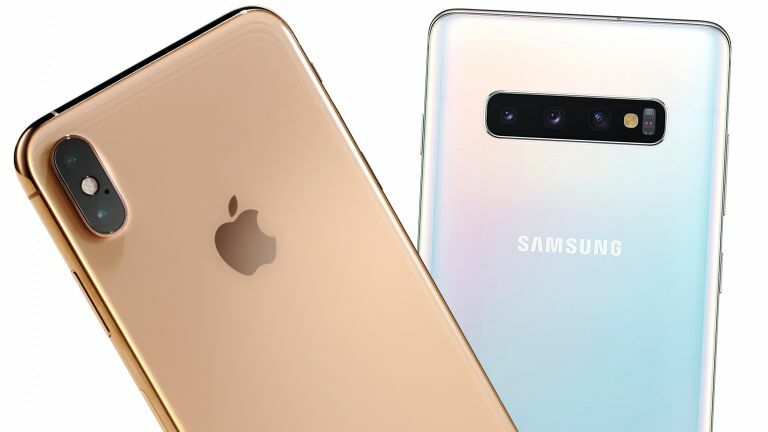 If you're wondering what the best smartphones of 2019 are we're about to tell you: from the stunning Apple iPhone XS Max to the mobile powerhouse that is the Huawei Mate 20 Pro, to the stunning fit-and-finish of the Samsung Galaxy S10 Plus, and the stupendously fast OnePlus 6T, T3's best phones guide is stuffed full of quality handsets. With its stunning design, powerful internals, and top-rate camera system, Apple's new iPhone XS is the best phone in the world in 2019, with the only question you need to ask yourself whether you prefer the XS Max's larger screen. Very strong rivals like the Samsung Galaxy S10 Plus and Huawei Mate 20 Pro come close but, if you can stretch to it, the iPhone XS / XS Max should be right at the top of your list of potential upgrades. Every quality phone worthy of your consideration – all the handsets that really stand out from the crowd – can be found in our best phone 2019 guide. Not only that, we've also packed this article with information to help you get the perfect phone for you. There's no doubt about it: we've gone to some pretty extreme lengths to ensure you've got the most authoritative smartphone guide on the web right here – we've tested every aspect of each phone, from screen quality to battery life, from internal specs to camera quality. We've also been able to spend some serious time with each handset in our best phone 2019 list as well, so we can let you know exactly what, say, the Google Pixel 3 XL, Xiaomi Mi 9 or Huawei P30 Pro smartphones are like to live with on an extended daily basis. We only include the best phones in this list, so you can be sure you're reading about the very latest, cutting-edge devices. We've listed all the phones in order of preference, too, so there's no confusion – the first phone is the best phone that you can get in 2019. So whether you're currently after the most powerful Android smartphone money can buy, or a shiny new iPhone upgrade from Apple, we've seen and extensively tested all the best phones on the market so you don't have to. The best phone in the world today? That's Apple's iPhone XS / XS Max. Is the Apple iPhone XS / XS Max the best phone you can currently buy? Yes. But only by a whisker. The Samsung Galaxy S10 Plus and Huawei Mate 20 Pro are, in terms of hardware package, two of the best phones ever made and easily trump Apple's top offering on the specs sheet. Overall, though, it's the ultra-desirability of the iPhone XS and larger-screened iPhone XS Max, as well as their seamless and super accessible user experience, that takes the smartphone throne for Apple. The first thing that strikes you about the design is, obviously, the gorgeous Super Retina OLED screen. It's certainly true that the edge-to-edge screen looks absolutely stunning, both from a design perspective and from a technology viewpoint, and it plays a big part in putting this top of our best phones of 2019 list. Watching movies on the screen is especially impressive: all of Apple's OLED phones support Dolby Vision (the most advanced kind of HDR), and it's supported by Netflix and iTunes movies, too, so there's plenty of content to watch – that counts on both the 5.8-inch XS and 6.5-inch XS Max. Aside from the screen, you've got Apple's blazing fast A12 Bionic processor, a fantastic dual 12MP camera with portrait lighting mode, and Face ID (which actually works very well). Compared to last year’s iPhone X, the Apple iPhone XS / XS Max has been subtly re-engineered pretty much from top to bottom, and the results are superb. Of course, we have to mention the price. The iPhone XS starts at a considerable £999 ($999), and the iPhone XS Max starts at £1,099 ($1,099), making it the most expensive iPhone to date. We'll say this: if you think that's too much money then the iPhone XS / XS Max isn't for you. Are the prices justified? Well, it's complicated. Just like a Louis Vuitton bag, there are more affordable alternatives that do exactly the same job, but it's all about prestige and branding. Apple has slowly been morphing into a luxury goods company for a while now, and the iPhone XS / XS Max is another step in that direction. It's essentially a luxury range from a designer brand, with Apple successfully creating an incredibly desirable package that comes in two different screen sizes. If you're looking for a premium smartphone powered by Android OS, then look no further than the Samsung Galaxy S10 Plus. Not only is this the fastest, most feature-packed and polished Galaxy smartphone that Samsung has ever launched, but it's also doing something truly different from the iPhone and other rival flagship handsets. Whereas competitors have rushed to clone the notched screen design that first gained prominence with the iPhone X, Samsung has taken a dramatically different approach with its Infinity-O design. Admittedly, that Infinity-O design isn't the prettiest thing to leave the Samsung R&D lab and definitely takes some getting used to. However, it has allowed Samsung to fit the S10 Plus with an expansive 6.4-inch AMOLED panel – that's the same size as the Galaxy Note 9 – while simultaneously shrinking the physical size of the smartphone compared to the Galaxy S9 Plus from last year, which sports a 6.2-inch screen. Elsewhere, Samsung has included dual-front facing cameras so you can shoot Live Focus photographs brimming with artificial bokeh-style blur. There's also some fun new depth effects with the Galaxy S10 range, including the ability to turn the background greyscale to make the subject of the image really pop. These can also be shot using the triple-camera on the back of the handset. The rear-mounted camera also boasts an ultra-wide angle camera, which produces some incredibly dramatic shots. It also has less of the unsightly distortion we've seen from rival ultra-wide angle cameras in the past. The Galaxy S10 Plus isn't perfect. There are some really gimmicky new photo modes (who wants the background to look like it's spinning?! ), the Infinity-O cut-out is a little bit unsightly and it can cost up to an eye-watering £1,399 for the maxed-out model with 12GB of RAM and 1TB of built-in storage. However, these are nitpicks, and don't stop this from becoming our new go-to recommendation for anyone who wants the best Android-powered smartphone. The Huawei Mate 20 Pro is one of the absolute best phones in the world in 2019. In our review of the Huawei Mate 20 Pro, T3's Robert Jones said "the Huawei Mate 20 Pro delivers an experience that leaves absolutely nothing to be desired and, for all real-world intents and purposes, it is perfect", before concluding "it's a phone that you'll soon fall in love with." And, with the world's fastest CPU, the lightning fast Kirin 980, a gorgeous OLED, HDR screen, a knock-out Leica-made camera system, a next-gen in-display fingerprint reader, a capacious and long lasting 4,200 mAh battery, as well as Android 9.0 Pie out of the box, it soon becomes easy to see how that high praise was won – and why this handset is so high on our best phones 2019 list. Indeed, the whole Huawei Mate 20 Pro package is so advanced, slick and complete, that it's hard to recommend any other best phone for 2019 if you're shopping at the premium end of the Android phone market – especially as the handset also packs that hyper-desirability that's normally the exclusive domain of Apple's flagship iPhones. The Huawei P30 Pro has a camera system that simply excels. If you are a photography enthusiast and prefer the Android ecosystem to the iPhone one then, traditionally, we'd be pointing you towards Google's Pixel range of phones, specifically the latest and greatest Pixel 3 XL, as these devices have become famous for their excellent camera systems. Now, though, while the Google Pixel 3 XL is still a superb phone, the Huawei P30 Pro and its jaw-droppingly good quad-camera system has come along and largely stolen its thunder. Indeed, in our review of the P30 Pro we said that, "the phenomenal 5x optical and 10x hybrid zoom are unlike anything we've used before and allow you to capture photos that you simply wouldn't be able to get with any other smartphone." And that is saying nothing of the phone's very impressive Night Mode photography, or its sharp and colour-vibrant images with little noise, either. The P30 Pro isn't just about photography, though, with a large 6.47-inch screen, rapid Kirin 980 central processor, and long-lasting 4,200 mAh battery helping to deliver a fully rounded flagship experience. Certain aspects of the device can't compete with some of the higher-ranked phones in our best phones of 2019 guide, such as the higher resolution screen on the Mate 20 Pro, or better user interface and screen vibrancy on Samsung's Galaxy S10. But for many users the P30 Pro's suite of quality hardware, excellent camera system, and numerous high-end features like a fast in-screen fingerprint scanner and reverse wireless charging will be more than enough to see it rung up. More than just a productivity powerhouse, the Samsung Galaxy Note 9 is a do-everything powerhouse. With its absolutely stunning 6.4-inch Super AMOLED screen, powerful internal hardware suite, and advanced new S Pen digital stylus, the Note 9 is undeniably one of the best Android phones available today and, simply put, delivers strongly across the board. Indeed, when you factor in the phone's excellent camera system, competitive battery, and audiophile audio credentials, you realise that this isn't just a work-focused productivity powerhouse, but a do-anything powerhouse that easily makes our best phones 2019 list. In our review of the Galaxy Note 9 we stated that it's one of "the most functional, feature-packed, and premium Android smartphones in the world", before concluding that "if you're shopping for a flagship-level new phone, and can afford its high price point, then you should definitely count it among your top contenders." While its admittedly high price point may put you off, as might the Android platform if you're used to iOS, you simply can't ignore what a polished and highly useful device the Note 9 is. The iPhone XR from Apple brings premium specs at a lower price. If you're an Apple fan and can't stretch financially to the 5-star awesomeness that is the iPhone XS and iPhone XS Max, then the iPhone XR makes a great case as a cheaper alternative – and so it could well be the best phone for you in 2019. The iPhone XR comes in a variety of attractive, bright colours, and features a quality 6.1-inch HDR Liquid Retina display, Apple's latest and greatest A12 Bionic chipset, 3GB of RAM, a 2,942 mAh battery, and 64GB of storage space in the entry model (which can be taken up to 256GB with extra spend). It is, across the board, a well-equipped and very well made phone that, straight out of the box, feels great in the hand. What you don't get in the Apple iPhone XR is the same flexibility of camera that you get in iPhone XS. Plus, the screen (while large and clear) is also trumped by the XS range and some other, equally-priced devices. Regardless, though, as T3 concluded in our official review of the phone, the iPhone XR delivers "a full iPhone experience for a great price. It deserves to stand outside of the shadow of the iPhone XS, offering a finely balanced experience that takes most that phone's premium feel, and throws in a couple of tricks of its own." As such, we feel the iPhone XR is the best phone Apple currently makes in terms of bang for your buck, and as such is an easy recommend for most users. The Honor View 20 is the best mid-price range Android phone on the market today. With its incredibly bold Aurora nanotexture design, massive 6.4-inch screen, and incredibly rapid 7nm Kirin 980 processor, the Honor View 20 certainly delivers you bang for you buck. And that's saying nothing about its flagship-level RAM and storage options either! And it certainly is that affordability that really elevates the Honor View 20, as the phone is very much a mid-price range device, with the base unit of the phone retailing for a penny less five hundred notes, and the top-spec version still only ringing in at £80 more at £579.99 in the UK. Throw in a strong camera system that boasts the showboating ability to shoot 48MP images, some advanced GPU Turbo 2.0 tech that makes any Android game run like a dream, and the very latest version of Android 9.0 Pie and Honor's own Magic UI 2.0.1, and you're left with a device that can compete benchmark-wise with phones hundreds of pounds more expensive and leaves very little to be desired. Yes, you don't get some flagship phone-level features like wireless charging (or reverse wireless charging) or an in-display fingerprint reader, but they seem small compromises considering the package you do get for your money – and it's a package that includes a screen with a natty pin-hole front camera. The Google Pixel 3 XL is a great smartphone for photography enthusiasts, thanks to its excellent camera system. The Google Pixel 3 XL is one of the best smartphones going in 2019 – especially if you prioritise camera quality and want a vanilla software experience that comes straight from Google. It ain't cheap, but it offers Apple levels of prestige and premium. Indeed, whether it's the excellent camera, the metal-and-glass chassis, the oodles of power involved or just the fact that the software and virtual assistant work in perfect harmony with the hardware, Google gets a hell of a lot right with the Pixel 3 XL. Indeed, pure Android 9.0 Pie out of the box partnered with Qualcomm's very capable Snapdragon 845 processor, 4GB of RAM, and 128GB of storage space is a very tasty combination in terms of UI speed and app performance, and the engorged 6.3-inch, 18.5:9 aspect ratio screen makes looking at anything a pleasure, too. It's the single-lens, 12.2MP rear camera though that is the real star of the Pixel 3 XL show – with just one lens it manages to deliver truly superb detail, colour and image sharpness. It's not a huge improvement over the Google Pixel 2 XL, but that phone's camera was already among the best in class, so this unit truly is something special. The OnePlus 6T is one of the best phones available today for pure speed. The OnePlus 6T is one of the absolute fastest Android phones on the market and easily makes it into our best phones for 2019 list. Its combination of the high-end Snapdragon 845 CPU, powerful Adreno 630 GPU, and a whopping 8GB of RAM (that's 4GB more than the Samsung Galaxy S9), means that the OnePlus 6T smokes much of the opposition in terms of benchmark scores. The phone's use of Android 9.0 Pie and OnePlus' own light skin of vanilla, OxygenOS, adds to this rapidity, too, with menu navigation as well as app loading and switching a buttery smooth experience. The phone's 6.41-inch 19.5:9 AMOLED screen isn't the absolute best on the market, nor is its camera system (which is borderline identical to that on the OnePlus 6). Its battery, too, is merely competitive, and is soundly beaten by devices like the Huawei Mate 20 Pro and Samsung Galaxy Note 9. This said, though, in terms of pure speed the OnePlus 6T sits at the top table of flagship phones, and its maker also delivers a device that is beautiful to look at and to hold. The in-box package of accessories is also first class, which taken with its mid-range price point, help make it a very attractive phone package overall and well worth a place on our best phones of 2019 list. The Xiaomi Mi 9 is the latest flagship from the Chinese firm to hit the UK and it brings a lot with it: high end specs (including a Snapdragon 855), nicely finished looks, a fantastic screen and impressive camera performance. While the Mi 9 might not seem to stand out against the S10s and Pixel 3s of this world, when you check the price the appeal of this phone becomes clear – it goes toe-to-toe against the best in terms of specs and looks but at a much lower price. Almost every aspect of the Xiaomi Mi 9 impresses, including the different camera modes, and the longer-than-usual battery life, and the small teardrop notch that doesn't take much away from the display. If you're nit-picking you could say the MIUI software isn't the best in the world, and there's no IP68 waterproofing or expandable storage here, but everything considered – and at this price – it's definitely one of the best phones of 2019.